Show your best side with Broad street Movie Studio productions. Edit video in nearly any format, including beautiful 4K XAVC S (4 times the resolution of HD). Stylize your music video with high-quality video effects, transitions, titles, and filters. Fix washed-out footage or match the color of different clips to provide continuity from scene to scene. Optimized workflow's combined with a huge array of effect options, title and music components,color correction and creative transitions enable us to create films that are truly unique. These additional transitions, effects, and titling tools provide more options to enhance audio and video projects with a professional look and feel. Let us help you Take control of your own creativity and make movies that matter. 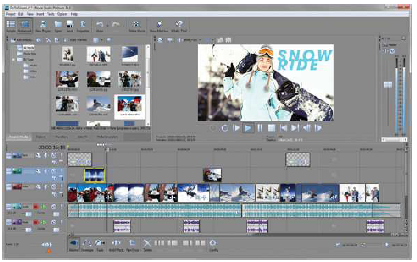 Weave your ideas into high-quality videos that can be burned to a DVD or Blu-ray Disc™! We have the LiveWedge available for events. It is a video switcher/mixer with 4x HDMI inputs and the ability to broadcast live video simultaneously via the Internet. It can be controlled with a smartphone or tablet via the user friendly control app. Video PinP and chroma key composition are supported as well as standard wipe, fade and cut transitions.We also have Ben Q projectors and screens. The powerful new tapeless AG-HMC150 joins the Panasonic line of professional HD camcorders. This new AVCCAM camcorder features highly-acclaimed functions for the popular AG-DVX100 Series of DV-tape based camcorders to tapeless HD recording. Using the cost-saving AVCHD format to record onto SDHC or SD Memory Card media, the AG-HMC150 produces exceptional images and responds to creative production needs. It also features a 28mm (35mm equivalent) wide-angle lens — widest in a professional camera of this class — and a newly developed 1/3-inch 16:9 progressive CCD. It further enhances image quality by adding a higher-quality PH mode to the clean, extended-time recording abilities of the AVCHD format. The AG-HMC150 handles full-pixel (1920 x 1080/1280 x 720) 24p and 30p progressive recording, and includes cinelike gamma and other versatile functions to meet the special needs of creative image production.